7 Insider tips for Rome! After having lived and studied in Rome for five years, here are some tips on things to do in the Eternal City to discover the authentic Roman culture and make your stay special! Walk up the Aventin hill, away from the main tourist spots, and you will find a long white wall with a large green door leading to the ‘Priority of the Knights of Malta’, a religious order created in the Middle Ages and still active. 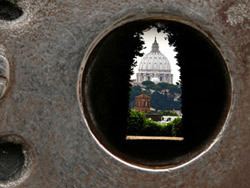 Just look through the keyhole on the door and you will be amazed at what you can see: a stunning framed view of St. Peter’s Basilica at the end of a beautiful tree-lined path. It is incredible how the keyhole vista lines up perfectly with St. Peter’s cupola! Roma is the city for everyone!! I took a 6 week course in Roma and thoroughly enjoyed every minute of it! 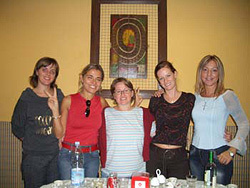 Roma is definitely a city that suites all types of people as it has everything and more. It’s a big city but almost everywhere you go you can see beautiful old roman buildings! The city is full of so many things to do and the roman people are SO friendly! It’s also so easy to get around the city by either bus or metro. The school is in the centre, and so after school you can head into the centre for sightseeing, or go for a stroll and get an ice cream – I really got addicted to Italian ice cream whilst I was there! The food is also amazing and there is a great typical restaurant just around the corner from the school, where many Italians and students go. As I sat in the taxi on the way to my accommodation I began to realize just how beautiful Rome and the Italian language really were, and I was very excited for my Italian course to begin. The remarkable ancient buildings surrounded me as we drove through the Roman streets, and I couldn’t help but stare out the window the whole time! I asked my driver a 1000 questions abo de the whole way there! He pointed out famous buildings, cathedrals, and the river, and he made sure to tell me over and over again how much he loved Rome. My host family was very comforting, and showed me their cozy European apartment. It had beautiful marble and stone floors and paintings in almost every room! Of course the kitchen always smelled of fresh garlic and herbs, I never went hungry!! The whole family seemed to have a much better fashion sense that anyone I knew back home, even the little children! They dressed with casual elegance, and always seemed to have a beautiful scarf and shoes to go with every outfit. How do they make jeans and a shirt look so stylish? I’ve just spent two weeks on a Club 50 course Rome. Although I am a retired teacher, this has been my FIRST vacation on my own! My daughter is now old enough to take care of my husband for a while, so I took this opportunity to fulfil a long-held dream to visit Rome! Before my trip I was worried about not really being able to speak the language. I’ve being studying Italian at home for a year, but really can’t speak it at all…, but fortunately everyone at the school in Rome, and ESPECIALLY my teachers, are very patient! The teachers don’t seem to mind at all about my slow pace, my many mistakes and lack of vocabulary… It’s hard to believe, but we really do communicate in Italian …somehow! 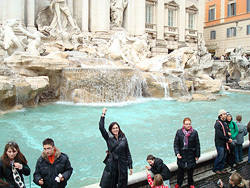 This is good for me, because to be honest, studying was not the only object of my trip… I also wanted to see Rome! I don’t know how to start here… Maybe I should tell a little about myself first. My name is Camilla, I’m Norwegian and 19 years old. I’m totally fascinated about Italy, and I’ve always dreamed about learning Italian, a language I consider as the world’s most beautiful. So, I decided to take the plunge and learn the language by signing up for an Academic Year Italian language course programme in Rome! Enjoy Yourself When in Rome!! After an awesome trip to Italy, I am convinced that the number one city for an Italian course is ROME! It has such a unique atmosphere, incredible sites and sounds, and friendly locals everywhere you turn. I loved it so much I found it hard to say goodbye! 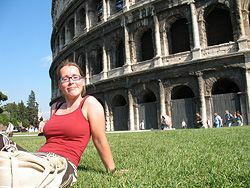 I’m studying at a language school in Rome and in September we went on an excursion in the cities of Pompeii and Naples. I wasn’t sure about going there, but my teachers told me it was something that I should have seen. They were right! We met at the school at 7.45 a.m. to take the bus that took us to Pompeii. The first spectacular thing when you arrive, is of course the view of the Vesuvium in the background of the antique city. 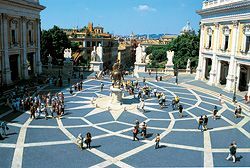 When you take a walk in the streets of the Roman antique city, you can discover thermal baths, laid, temples, basilicas, forums, sanctuaries, a big number of houses, villas, enceinte, necropolis, bakery, theatres, amphitheatre, portiques, public’s fountains and thermopiles. Rome – a city of culture and beauty! I’ve just come back to Rome after studying Italian last year for 2 months in this beautiful city. It was a great experience, not only because I met a lot of nice people from all around the world on the course, but because I was in Rome! Last year I participated in a photo competition organised by the school and I won the first prize which gave me the chance to come back for another two weeks. So here I am once again in Rome. After arriving in Rome, I immediately felt at home. Even though Rome is the capital of Italy, it doesn’t feel like a big city. There are so many things to see here, the Colosseum, the Pantheon, the Vatican and so many other things, but there is more to Rome. If you just walk around the city you will find places that are beautiful and without many tourists. 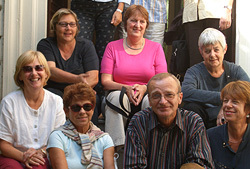 For example I did a “passeggiata” (a walk) with some people of the language school to the quartiere Coppedè. This is a lovely part of the city with some nice architecture. Do you know how I spend my Sundays in Rome? 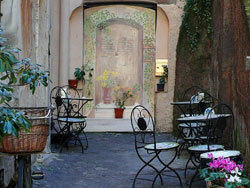 In Trastevere, Rome’s best-kept secret! From early morning, Porta Portese, in the heart of Trastevere hosts Rome’s flea market, where you can find 100s of stalls with second-hand clothes, antique-trade articles and all kind of rubbish! It is so big and wide that we spend all morning there till lunch time… For lunch, I usually go with my friends to Bibli, a library where they offer a quick-lunch while reading any kind of books! Always open in the small streets there are craftsmen shops as well as street-shops with articles from all over the world. I really can say it is a multicultural district!